Carlo Farina (c1604 - 1639) was one of the most important Italian violinists of the early 17th century. He kept experimenting and pushing the envelope of what the violin was to accomplish and is believed by some scholars as the inventor of the double stop technique (or at least the first to feature it prominently enough in his works). Although his stay in the Dresden music court was brief, but it had a lasting effect, as he brought the Italian sonata and violin style to the German speaking countries, and within years the Germans and Austrians would produce some of the most brilliant violinists in Europe, names like Schmelzer, Walther, Westhoff, and of course, Biber. All of them show traces of Farina's influence. Born to a viol player in Mantua, Farina probably received a very solid music training from his father. An aspiring young musician in the early 17th century Mantua was truly blessed. The great Monteverdi made his stay in Mantua during this period, and Salomone Rossi also called Mantua home during this time. In addition to learning the violin, considered to be a young instrument at the time, he probably soaked up the musical language of the two masters pretty quickly in creating his own musical idiom. In his mid-twenties, he left for Prague, where his outstanding musical talent earned him a recommendation to work in the Saxony court in Dresden. Led by Heinrich Schütz, the Dresden court musicians were considered one of, if not the best in Europe. Surrounded by superb music talent, Farina led an active and productive musical life. All his five published books were written during a period of 2 years, and these are the only works that have survived. However, his stay in Dresden was cut short because of the Thirty Years War. In deep financial crisis, his employer could no longer pay him. Farina traveled through the European continent during the subsequent years, having been to Cologne of Germany, Parma and Lucca of Italy, and Danzig, now part of Poland. Farina eventually ended up in Vienna, when Empress Eleonora wanted a capella of her own. Farina died in Vienna in 1639, spending the last two years there. Today, Farina, like Pachelbel, is primarily remembered as a one-hit wonder. Although, in Pachelbel's case, his infamous Canon in D is known by the entire world, whereas Farina's Capriccio stravagante is only vaguely heard by even the semi-serious Baroque listener. To briefly describe the piece, Capriccio stravagante is a piece where an ensemble of bowed instruments mimic animal sounds and other instruments, such as the cat, dog, hen, guitar, and drums. Written a few decades before Biber's great Sonata Representiva, it was certainly very inventive and original for its time. This CD is not about Capriccio stravagante. It is a recording of the complete sonatas from his five published opuses, written for one or two violins and bass continuo. Unlike the Capriccio stravagante, which is light and humorous, these sonatas are serious pieces of work, as they were back in the early 17th century. As were typical of sonatas of the day, Farina's sonatas are free-flowing single movement sonatas with multiple contrasting sections, either in terms of tempo, mood, and form. 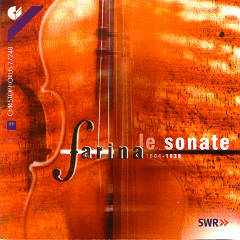 In the sonatas for 2 violins, Farina avoids using much counterpoint, instead focuses on the interplay of the violins and rhythmic variations between sections. Unlike Bertali, who wrote sonatas for larger string ensembles, Farina's sonatas for just one or two violins allow him to explore the capabilities of the instruments, writing more virtuosic passages. Many times, there are sections where the two violin parts seem to be moving at parallel thirds. A closer inspection of the score (the library had scores of one or two sonatas edited by none other than masetro Goebel) reveals that the violins actually leap back and forth between the upper and lower voice. It was thought that such writing would allow the music to blend more seamlessly. To the casual listener like mine, it is easily overlooked (overheard). Last but not least, Farina also uses musical elements from other nations, conveniently found in the sonatas' titles, like Polaca (Poland) and Cingara (Hungary). The musicians on this disc are all German musicians. The role of the violins fall on Lukas Friederich and Christine Busch. Friederich started out as a serious modern violinists, even studying with Dorothy Delay. However, after working with Reinhard Goebel extensively, he now plays on the Baroque violin. Busch has played in top period ensembles like the Freiburg Baroque Orchestra and the Akademie für alte Musik Berlin. As with a very German approach, the musicians here have a very powerful masculine sound to the music, throwing any feeling of lightness out the window. This is consistent with the sombre mood that most early Italian sonatas generally conveyed, and the approach is convincing. However, virtuosic passages are given a lift by the continuo group, whose strumming archlute and crisp harpsichord spring liveliness in them. Keep in mind though, that the sonatas all start and end seriously, and despite the breathtaking passages in between, the listener is kept wound continually at a high tension. Sitting through all the sonatas in one taste is a feat and not recommended, as the strongest of minds will start to fatigue. Instead, divide this disc into multiple sessions, pick up where you last left off, and the effect is sublime. The fact that this disc is recorded by German musicians is greatest homage paid to Farina on how he was to shape 17th century German and Austrian instrumental writing. Imagine a universe where Farina did not exist, they'd be probably be asking us "Biber who?"